Nov. 28, 2018: On the Friday before Thanksgiving, nine members of the Senior Citizens Council ("SCC") made their annual trip to Costco to shop for food to give 25 families a hearty Thanksgiving meal with all the trimmings. Each family received a turkey, potatoes, fruit, stuffing, corn, cranberry sauce, apple juice, pie, and whipped cream. The food is distributed through the Eastchester Community Action Program ("ECAP"), which is in Tuckahoe. The Thanksgiving tradition started almost 20 years ago when Audry Sullivan, the SCC chair, suggested that the council give turkeys to ECAP to distribute to families in need around the area. 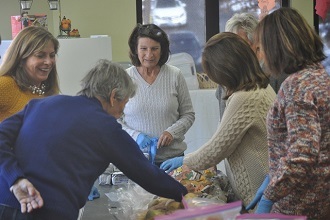 At that time, the council used a room for its monthly meetings at the Tuckahoe location and thought it would be a kind gesture to help out ECAP with its Thanksgiving program. After several years of buying only turkeys, it was decided that the SCC would buy everything for the families' Thanksgiving Day meal. SCC co-chairs Sheila Landsberg and Linda Nagle have also been part of this committee for many years. “This giving of Thanksgiving baskets right in the heart of my neighborhood feels the most rewarding," said Landberg. "I recognize some of my neighbors, who are truly grateful for what we do for them." 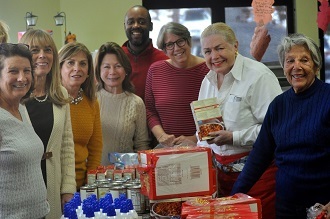 Members of the SCC gather to assemble the Thanksgiving baskets at ECAP. ECAP gave out more than 225 baskets of food this year to families in Eastchester, Tuckahoe, and Bronxville. There are many organizations that donate to the food pantry at ECAP, which enables them to help so many families. 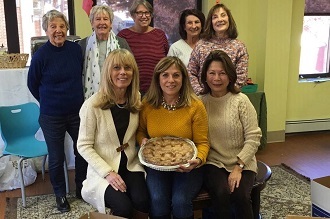 Both the Tuckahoe and Bronxville senior centers have food drives in November requesting Thanksgiving food donations to put in the holiday baskets as well as area churches and other community supporters. 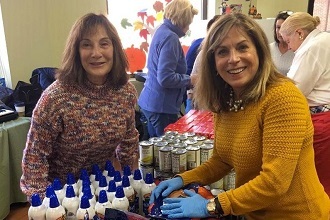 Lillian Veneruso (L) and Linda Nagle organize food for the Thanksgiving baskets at ECAP. 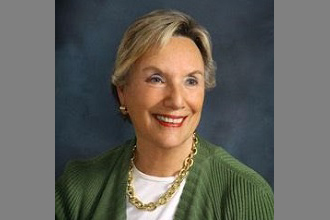 The Senior Citizens Council is made up of members from both Tuckahoe and Bronxville who oversee the community centers for older adults in both villages. The funds to pay for the 25 Thanksgiving baskets are from donations given by each council member and others in the community who have learned about the project over the years. Back (L-R): Bumpty McGrath, Gail McCarthy, Mary Liz Mulligan, Eleanor Gustafson, and Lillian Veneruso; front (L-R): Lorraine Mohan, Linda Nagle, and Sheila Landsberg. Pictured at top (L to R): Eleanor Gustafson, Lorraine Mohan, Linda Nagle, Sheila Landsberg, Don Brown, director of ECAP, Mary Liz Mulligan, Bunny Micolino Almy, and Bumpty McGrath.